I’d anticipated another post on reverse payments today, but it will have to wait until Monday. With only one week to go before the holidays I’m swamped at work and accumulating significant delays on a bunch of non-work stuff (several articles, book reviews, paper grading, etc.) which, for some reason, I had committed to do before the holidays. It makes you reflect. This is one of the peculiar features of private practice; you try to do your best in work-related matters and you end up doing all other stuff hastily and sometimes badly. It’s never bothered me that much, but it probably bothers others (the ones you pay less attention to, or the ones that suffer your delays). I don’t know to what extent this is inherent to the profession or to my irrational tendency to embark in all sorts of projects (or most likely both), but it clearly is an area in need of improvement, at least in my case. Tips welcome! I won’t bore you with details on what keeps me busy and what I’m being unable to do (it actually was my initial plan, but I then I realized that with a too personal post I’d risk ending up appearing as another whining-while-at-the-same-time-bragging lawyer). Actually, even this actual post may be enough to convey that impression, but that’s not the intention. Anyway, let me give you an example of me doing non-work things at the last minute badly and how I resorted to Nico to fix it. As usual, preparations were done at the last minute. The problem, however, is that I was asked to deliver a fairly detailed ppt in advance (smart trick to force speakers to prepare in advance..). And that was a bit of challenge; so I resorted to Nico. He has an excellent and incredibly detailed power point presentation on IP and competition law (I hate using power point, and not only because of its lack of interop with 3rd party applications… yes, cheap pun, but I couldn’t avoid it..) so I basically copy-pasted it in a Garrigues template ppt and used it (actually, I didn’t even do the copy-pasting myself; I’ve to thank Rocío de Troya for that). 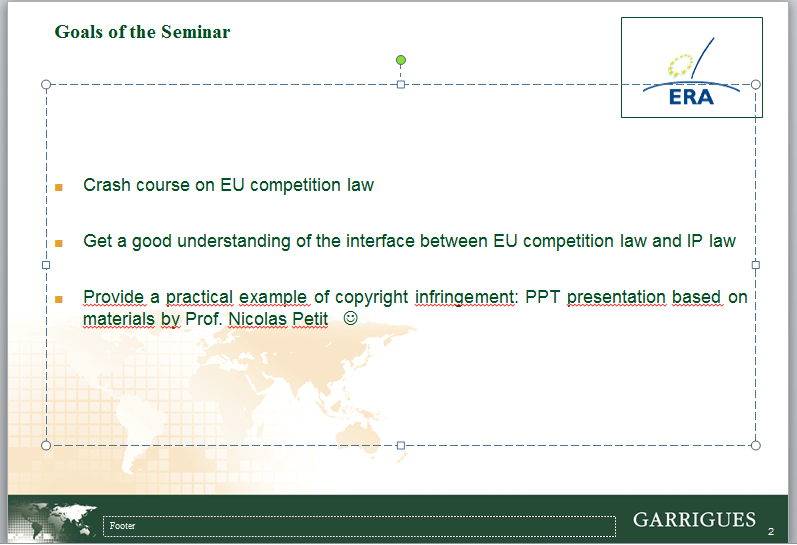 It ended up being a good idea, as I explained to the students, my use of Nico’s materials was useful to illustrate several concepts that are very relevant to IP law, such as a copyright infringement, free-riding and follow-on innovation (btw, the term “based” that you see in the slide above -the 2nd in my (his) presentation was actually a euphemism). You most likely don’t give a damn about this story, but put yourself in my shoes: I had to (i) thank Nico and acknowledge his authorship of the materials; (ii) write something quick and light for a summer Friday afternoon; and (iii) minimally and superficially reflect on the absorbent (for good and for bad) aspects of the profession.. Have a good weekend! I’m back to blogging after my leave of absence from for work. But since this blog is about personal thoughts, I nevertheless figured that I could share some not substance related thoughts on the experience. Regardless of what might happen, the hearing was intense, interesting and even fun. If you like competition law, litigation, technology and opponents who are challenging, it can’t get much better. 2) I’ve been a student of both my partners (Luis Ortiz Blanco and José Luis Buendía), of one of our client’s counsels (Alvaro Ramos) and of our opponent (Jean Yves Art was a truly good merger control professor in Bruges). I generally have a decently good -if long- response to that, and the fact is that I’ve -generally- managed to find the time to juggle everything. However, I recently whined justified myself wrote about not being able to find the time needed to write something worth your reading time, and commited to make a greater effort. However, in spite of my good intentions, I will not be able to honor my commitment (including the one about writing down my detailed views on Google’s commitments). I will be taking a short leave of absence until 30 May. In a way it’s a pity, because there’s most interesting stuff going on on which to comment, but work these daysis as interesting as it is absorbing. As it is becoming customary, Pablo Ibáñez (LSE) will be covering my absence. P.S. On Google’s proposed commitments, and in a nutshell, I would argue that the Commission’s strong hand play has yielded very good results for the Institution. Whereas I retain my doubts about the underlying and arguably unknown theories of harm, it’s hard to deny that the Commission has managed to extract very significant concessions from Google that should make its competitors’ lives easier. A couple of Swedish professors (M. Alvesson and A. Spicer) have recently published an article titled A Stupidity-Based Theory of Organisations in which they develop the concept of “functional stupidity” and conclude that organizations with too many smart individuals risk being disfunctional. Their article has been discussed in other places like Fortune or New Scientist, where it was originally published. The authors posit that stupidity boosts productivity, streamlines things in an effective manner, facilitates consensus, conveys respect for hierarchy, fosters a culture of commitment and effort, and that it can even help you (no offence; I didn’t mean you, I meant the stupid at issue..) get a promotion faster (the argument supporter the latter being that bosses would not promote their most useful assistants because they couldn’t do without them). Interestingly, the Fortune piece discussing this article and the benefits of stupidity concludes with a reference to Google’s simple and functional user interface (as already anticipated a few times, whether Google’s UI will be smartened up or made more complex thanks to DG Comp will be discussed in our upcoming comments on Google’s commitments; but don’t take my word for it, a couple of years ago we also committed to hold a Chillin’Competition conference and, well…). For more on stupidity, check out Cipolla’s masterpice on The Basic Laws of Human Stupidity. P.S. If you ask me, whereas there may be some logical basis and abundant practical evidence for some of this “functional stupitidy” theory, holding it as true would be a bit stupid, and, as most things stupid, quite dangerous. Being a competition lawyer one cannot help but to be interested in the competitive dynamics of the very market in which we operate. There are a few odd things to it, but I usually -although not on this blog- refer to one particular market failure in the market for EU competition law legal services: its lack of transparency (not price wise, but rather quality wise). My take on this (developed below) is that making certain legal submissions public would contribute to addressing this market failure. The report on accesibility of Court documents just issued by the European Parliament has given me an excuse not to comment on the Google commitments that I’ve been unable to read in full the push I needed to write about it. It’s funny to observe that the cult of personality/firms prevalent in the EU competition world is, to a great extent, grounded on practically no available information. Firms and individuals are revered and ranked in various ways and tiers; they (we) are reviewed, reveive prices, etc, but, if you stop for a sec to think about it: how do you know that any of them/us is any good? The maximum information that one can get about the quality of a firm’s or lawyer’s work merely relates to the cases in which a given firm/lawyers has worked. Interestingly, the outcome of those cases tends to matter little; what appears to matter is to have been involved in them. Many lawyers advertise the fact that they have acted on particular cases regardless of the result, and there’s no way of knowing whether they did excellent, good enough or poorly (at the extreme, I know a few cases of lawyers who show off for having represented clients in proceedings initiated as a result of poor legal advice in the first place). To be sure, although outcomes are, at times, a very good proxy, they are not a definitive criterion, for we often know little about the objectives pursued, about the details of a case, or about its a priori odds. Actually, telling whether an outcome is positive or not, as well as determining what a lawyer’s/economists’ contribution to this result was, is almost always unfeasible. I’d argue that the only ones who can really have an informed idea about how good a firm or a lawyer is are the people working at the Commission and at the Courts who have shared cases with them/us; they are the sole ones who are able to measure their/our work against the background of all factors in play (when it comes to pleading, the Mlex guys who listen in at the hearings could have something to say too; I’ve said before that Lewis Crofts could make some extra money by publishing a litigators’ ranking..) but no one asks them (and even if they were asked, it’s arguable whether they should disclose favoritism in this regard either). You could argue that in-house lawyers can be good comparative judges as well, but this is not always the case: in-house lawyers are often exposed to a very reduced subset of lawyers (sometimes retained due to political reasons outside their control). Moreover, many in-house lawyers may not be experts in the area for which they hire external lawyers (this is frequent in the competition world except when you deal with particularly large firms with specialized competition counsel), and very often the less risky thing to do is to pick people who others perceive as triple A, even if the reasons justifying the perception are ranking based unknown (the force of inertia and virtuous/vicious circles do the rest). I’ve worked in various cases where I’ve seen well-known lawyers and firms produce documents that were not…worthy. I’ve also seen well regarded firms (sometimes even the sames as in my previous example) produce excellent work. And I’ve also seen work by less-known firms that was pretty good. The interesting thing is that in these cases the quality of the work tends to impact the result ot the case, but not the firm’s/lawyer’s reputation, for good or for bad, because no one can see and assess what was done. In sum, to a great extent, law firms and economic consultancies are credence goods. If you ask me, the only way to get rid of many of the absurdities derived from this market failure, and to improve the quality of legal services at the same time, would be to increase the transparency of legal submisions. It has happened all too often that I read something (a document, a plea or an argument) and wonder whether it would have been billed for written had its authors known that it would be publicly available. Nico and Miguel Rato wrote a few years ago about sunshine regulation; I would argue that sunshine lawyering would also be a good thing; why not follow the example of the U.S., where Court filings are considered to be public records? There are very good reasons why this should not be the case in administrative proceedings, but I see no impediment in the case of Court proceedings, and nor does the European Parliament’s report recommending that changes be adopted in order to facilitate access to Court files at the EU level. Is associate lawyer the unhappiest job? Looking at my Facebook newsfeed last night I saw that a friend (well, a Facebook friend, you know) had posted a story on how, according to a Forbes’ story, associate attorney is the No. 1 in a list of unhappiest jobs. Legal assistant ranks 7th. The list of happiest and unhappiest jobs has been compiled by a jobs website called CareerBliss, which has based it on reviews completed by more than 65,000 employees, accounting for factors such as life-work balance, work environment, compensation, growth opportunities, company culture and control over daily work. According to this site, a great deal of associates’s unhappiness is due to billable hour pressure, as well as to prevalent up or out policies. I believe I might have gone a bit off topic… Coming back to the issue of unhappiness, you may remember that in the past we’ve devoted some attention to this issue. See, e.g. my random thoughts on life at law firms, Nico’s I love my job and my reply in Re: I love my job, or the more recent Where to work in Brussels? But the fact remains that there’s a problem, that many associates are unhappy doing what is and should be a most interesting job, and that many things could be done better, so we’d like to pose you a question: what do you think is the problem, and how do you think it could be fixed?